Will Ferrell stars as has-been scientist Dr. Rick Marshall, sucked into one and spat back through time. Way back. 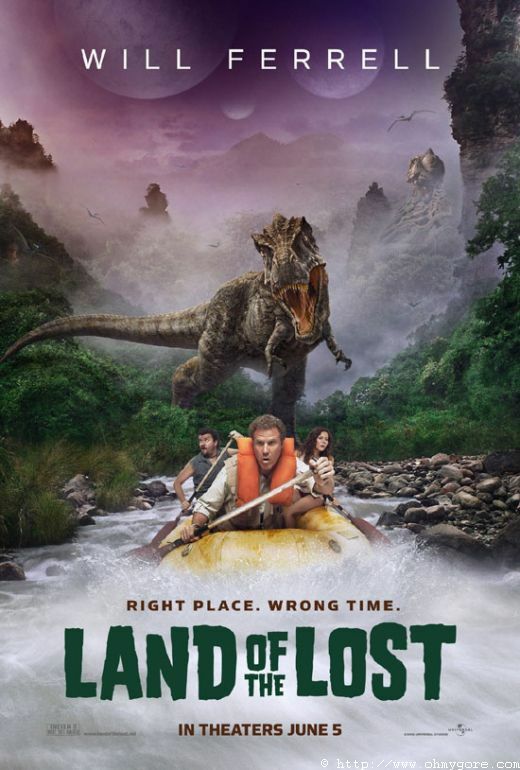 Now, Marshall has no weapons, few skills and questionable smarts to survive in an alternate universe full of marauding dinosaurs and fantastic creatures from beyond our world—a place of spectacular sights and super-scaled comedy known as the Land of the Lost. Sucked alongside him for the adventure are crack-smart research assistant Holly (Anna Friel) and a redneck survivalist (Danny McBride) named Will. Chased by T. rex and stalked by painfully slow reptiles known as Sleestaks, Marshall, Will and Holly must rely on their only ally—a primate called Chaka (Jorma Taccone)—to navigate out of the hybrid dimension. Escape from this routine expedition gone awry and they’re heroes. Get stuck, and they’ll be permanent refugees in the Land of the Lost. Based on the classic television series created by Sid & Marty Krofft, Land of the Lost is directed by Brad Silberling and produced by Jimmy Miller and Sid & Marty Krofft. This page has been seen 6286 times.